Så här inför semestern kanske man vill fuska lite innan man tar av sig kläderna, eller så vill man ha en gyllene färg året runt. Då är BUS ett måste! Ett populärt märke är COCOA BROWN och skaparen Marissa Carter kom till Stockholm berätta om sin serie med brun utan sol och hudvårdsprodukter. Jag ställde några frågor till henne och fick reda på det mesta om hur du blir snyggt brun på ett kick! Vill du titta närmare på produkterna eller få mer information finns det HÄR! When did you first come up with the idea of a product of your own? In 2007, I completed a certificate in Cosmetic Chemistry with the Circadia Institute in Philadelphia, USA and this created a desire to one day form my beauty line but it wasn’t until I became a mother for the first time in 2012 that I began to work on making that dream a reality. When my little boy was three weeks old, I one night applied a fake tan and went to bed, allowing my tan to develop overnight. I woke up and I was beautifully bronzed but so too was my baby boy! Half of his face and his little palms were bronzed from where he slept cuddled into my skin. I remember thinking that I was going to do something about having to wait eight hours for a self tan to develop, and I did. I began working with a manufacturer to develop the world’s first ‘1 HOUR TAN’. How long did it take to go from the idea to the first sample? Creating samples in the laboratory is the easy part, it’s the sample testing that takes six months to complete. Each new product must be rigorously tested for efficacy and safety before going on shelves. Do you have a tip for how to get tanned hands without tanning the palms? For a flawless application on hands I recommend applying a light layer of oil free moisturizer to hands beforehand and using a flat head stippling foundation brush to lightly buff tan onto hands. Hands should be placed in a ‘coffee cup holding’ position while tan is being applied. This ensures the tan gets into all the creases and you’re not left with any tell-tale white creases. Prepare skin for tanning by exfoliating in the shower with Cocoa Brown TOUGH STUFF which is a body scrub that contains finely ground pumice and will remove rough, dull, dry skin cells. The smoother your skin is, the more even the tan will look. Then apply a light layer of an oil free moisturizer. Always use a tanning mitt to apply self tanners. They guarantee a smooth blend of tan on the skin and achieve the quickest result. Cocoa Brown 1 HOUR TAN only needs to be left on the skin for one hour before it can be rinsed off and you can get dressed and hit the red carpet looking beautifully bronzed! Best way to mask the smell of self tanner? Search for self tans that contain an ingredient called DMI (Dimethylisosorbide), it decreases the scent associated with self tanners by up to 80%. DMI increases the absorption rate of self tanner into the skin thereby reducing the oxidization of product on the surface of the skin which is what causes the odor. All Cocoa Brown products contain DMI. Can/do men use your products? Yes, we have a lot men using our products. The mousse formulation of our 1 HOUR TAN is something they really like because it isn’t sticky, doesn’t clog in their hairs and dries quickly. Apply a small amount of petroleum jelly through the hairline and eyebrows before tanning. This will act as a barrier between hairs and tan so that the color doesn’t stain fair hair. I use a flat head, stippling foundation brush to apply tan to face and ears. This method gives a very natural, perfectly blended finish. This is like asking me which of my two children I prefer! If I had to choose though, I would say 1 HOUR TAN Extra Dark followed by Golden Goddess Oil to highlight the glow. If the tanner has gone on unevenly what is your best trick how to remove or mask this problem? Mix the juice from one lemon with your favorite body oil and apply to the skin. Then take a table spoon of Cocoa Brown TOUGH STUFF and use it dry on the skin to exfoliate the area and then rinse. How often should one re-apply for a long lasting tan? For a day at the beach, would you use self-tanner? Always! When skin is exposed to UV rays from the sun, it produces melanin which gives your skin a tanned look and helps protect skin from damage. When you apply self tan, it produces melanoidins in the skin which also pigment the skin but they do not provide protection from skin damage, for this reason, it is very, very important to wear an SPF over your fake tan if going to the beach. Which celebrities use your products? 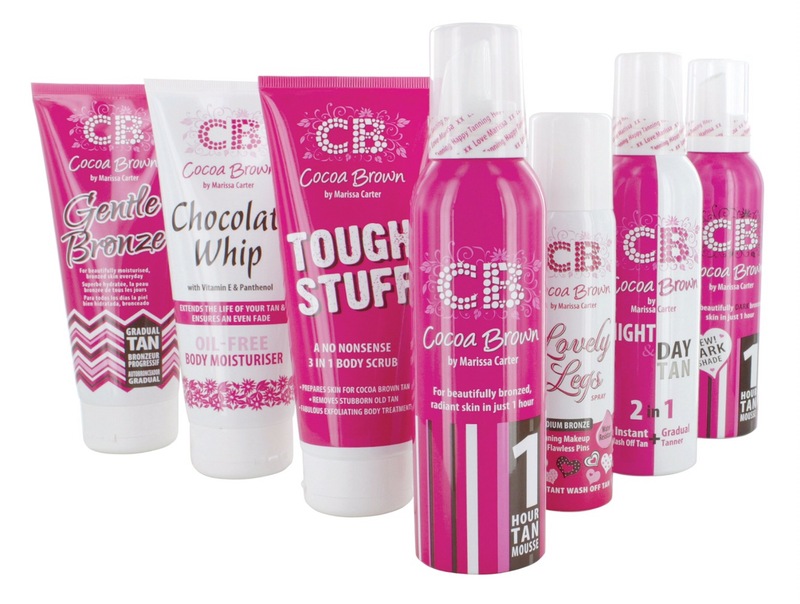 Kylie Jenner, Khloe Kardashian, Little Mix and Millie Mackintosh have all worn Cocoa Brown. I would love to see Kate Hudson wearing Cocoa Brown. She’s so naturally beautiful and always looks incredibly radiant whether she’s on the red carpet or surfing with her children. How many countries have your products? We are sold in approximately 10,000 stores worldwide, across 20 countries. I haven’t visited them all but because Sweden is our fastest growing market, it was very important to me to visit. I also fell in love with Sweden twelve years ago when I spent six months working for Swedish spa brand Kerstin Florian. I fell in love with how elegant and beautiful Stockholm and its’ people were. No one does natural beauty better than Swedish women! Do you have plans for more tanning products or makeup? Yes! I will be back in Sweden soon to launch two new products but they are top secret until then! Carina Nilsson började som modell 1988 och jobbade många år internationellt i Milano, Paris, Miami och New York. Vid 25 år ålder, på ett modelljobb för badkläder, blev den ordinarie sminkösen sjösjuk och Carina fattade tag i sminkväskan och fann sin passion! Hennes kunder inkluderar Plaza Kvinna, Modecenter, TV4, Rosa Bandet/Cancerfonden, MTG mfl. och nu är hon ansvarig för sminket här på Aftonbladet TV där hon och Fanny ser till att alla programledare och gäster blir snygga inför sändningarna! Premiär för både mig och Partiprogrammet!